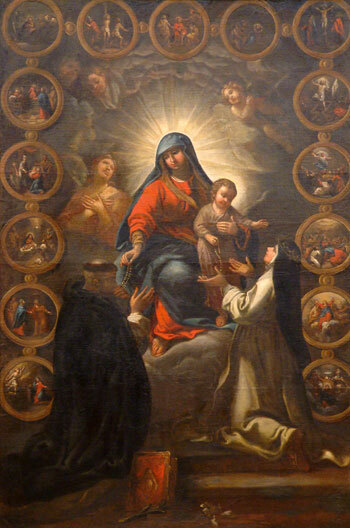 First, say the “Come, Holy Ghost“, and then make your offering of the Rosary: I unite myself with all the Saints in Heaven, and with all the just on earth; I unite myself with Thee, my Jesus, in order to praise Thy Holy Mother worthily and to praise Thee in her and by her. I renounce all the distractions that may come to me while I am saying this Rosary. Oh, Blessed Virgin Mary, we offer thee this Creed in order to honor the faith that thou didst have upon earth and to ask thee to have us share in the same faith. First Decade: We offer Thee, O Lord Jesus, this first decade in honor of Thine Incarnation and we ask of Thee, through this mystery and through the intercession of Thy most Holy Mother, a profound humility. One Our Father, ten Hail Marys, Glory be to the Father . . . Grace of the mystery of the Incarnation, come down into my soul and make it truly humble. 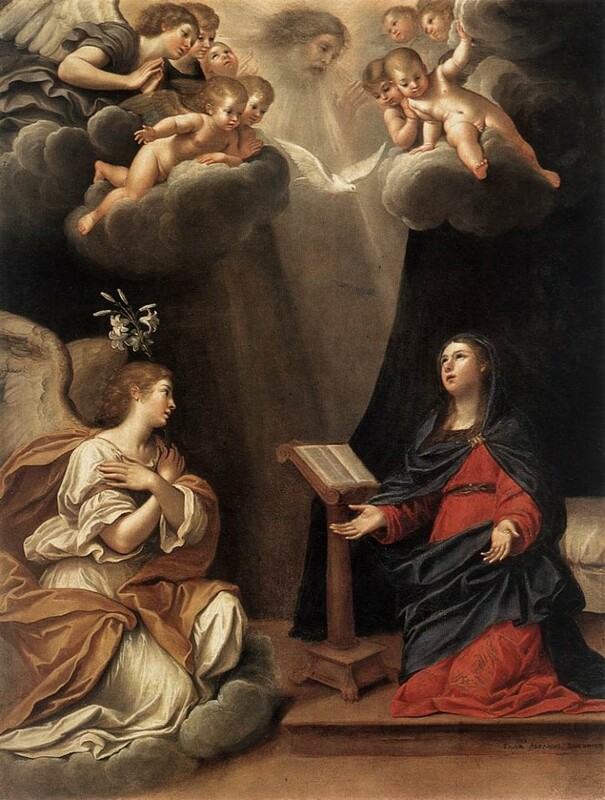 Second Decade: We offer Thee, O Lord Jesus, this second decade in honor of the Visitation of Thy Holy Mother to her cousin Saint Elizabeth, and we ask of Thee through this mystery and through Mary’s intercession, a perfect charity towards our neighbor. One Our Father, ten Hail Marys, Glory be to the Father . 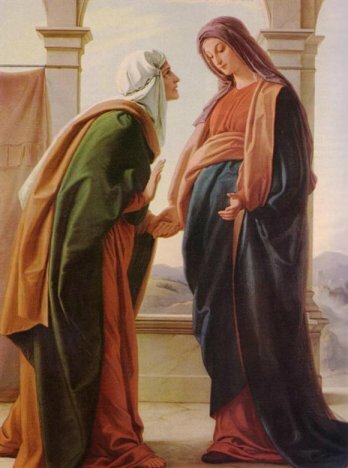 . . Grace of the mystery of the Visitation come down into my soul and make it really charitable. Third Decade: We offer Thee, O Child Jesus, this third decade in honor of Thy Blessed Nativity, and we ask of Thee, through this mystery and through the intercession of Thy Blessed Mother, detachment from things of this world, love of poverty and love of the poor. One Our Father, ten Hail Marys, Glory be to the Father . 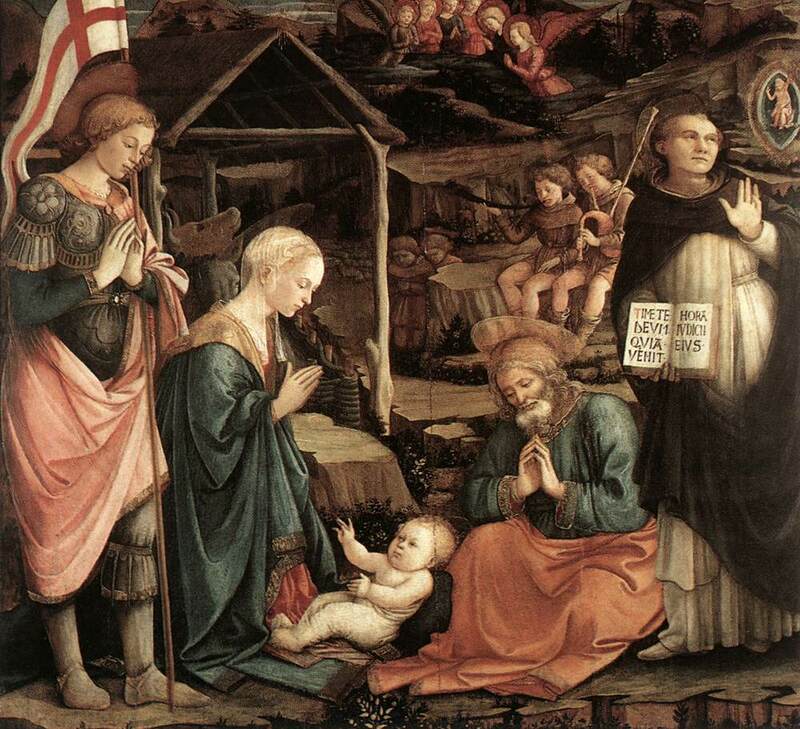 . . Grace of the mystery of the Nativity come down into my soul and make me truly poor in spirit. 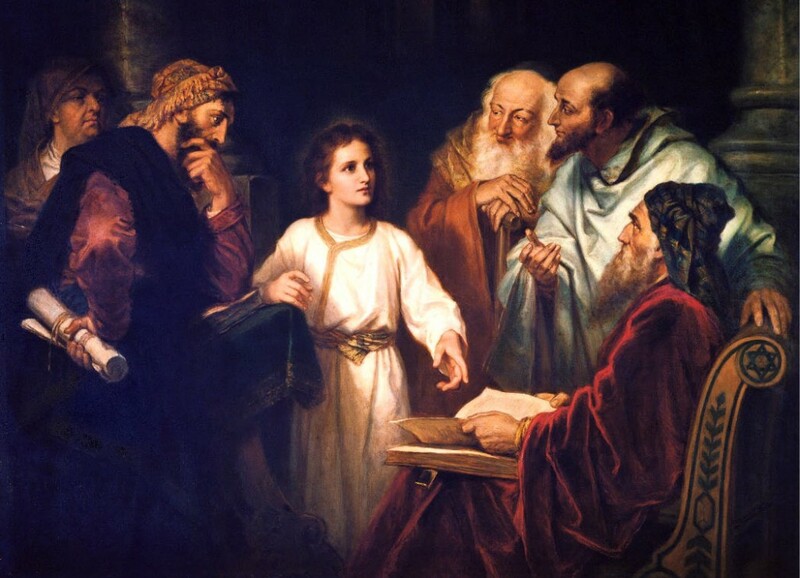 Fourth Decade: We offer Thee, O Lord Jesus, this fourth decade in honor of Thy Presentation in the temple by the hands of Mary, and we ask of Thee, through this mystery and through the intercession of Thy Blessed Mother, the gift of wisdom and purity of heart and body. One Our Father, ten Hail Marys, Glory be to the Father . . . Grace of the mystery of the Purification, come down into my soul and make it really wise and really pure. Fifth Decade: We offer Thee, O Lord Jesus, this fifth decade in honor of Thy Finding in the Temple among the learned men by Our Lady, after she had lost Thee, and we ask Thee, through this mystery and through the intercession of Thy Blessed Mother, to convert us and help us amend our lives, and also to convert all sinners, heretics, schismatics and idolaters. One Our Father, ten Hail Marys, Glory be to the Father . 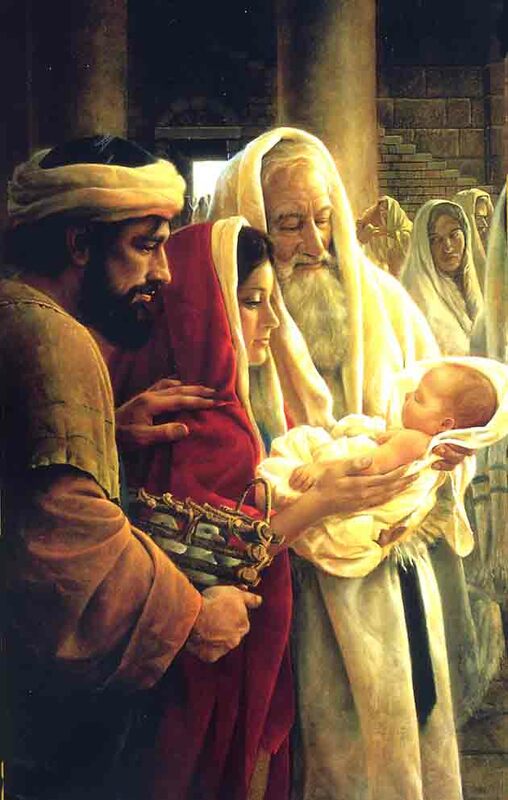 . . Grace of the mystery of the Finding of the Child Jesus in the Temple, come down into my soul and truly convert me. 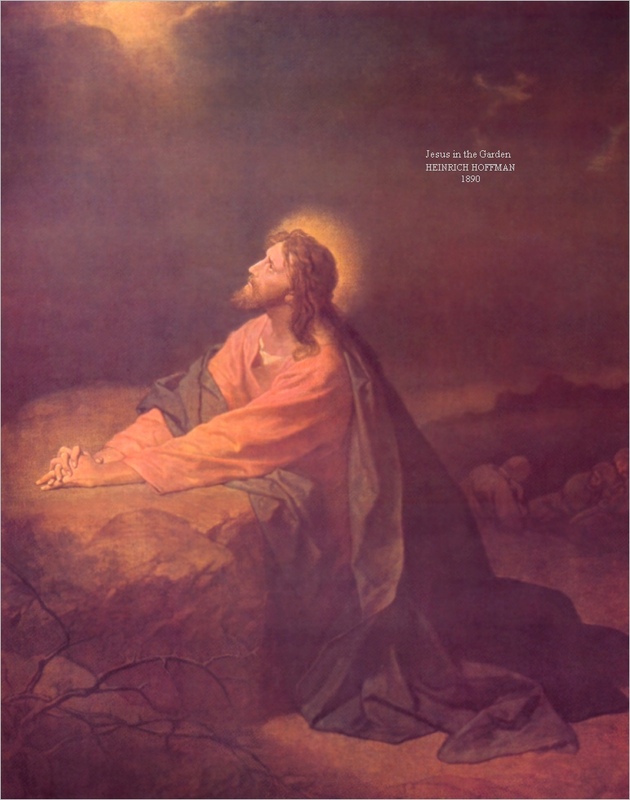 Sixth Decade: We offer Thee, O Lord Jesus, this sixth decade in honor of Thy mortal Agony in the Garden of Olives and we ask of Thee, through this mystery and through the intercession of Thy Blessed Mother, perfect sorrow for our sins and the virtue of perfect obedience to Thy Holy Will. One Our Father, ten Hail Marys, Glory be to the Father . 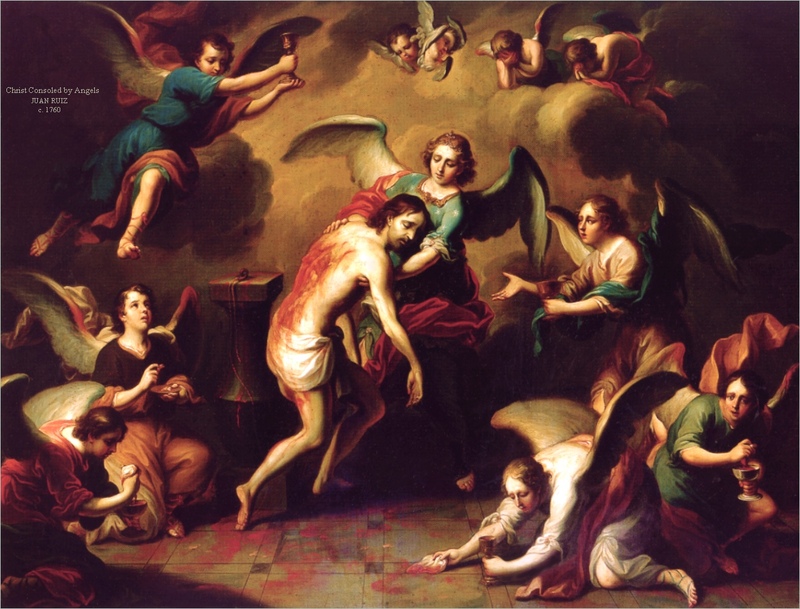 . . Grace of Our Lord’s Agony, come down into my soul and make me truly contrite and perfectly obedient to Thy Will. Seventh Decade: We offer Thee, O Lord Jesus, this seventh decade in honor of Thy Bloody Scourging and we ask of Thee, through this mystery and through the intercession of Thy Blessed Mother, the grace to mortify our senses perfectly. One Our Father, ten Hail Marys, Glory be to the Father . . . Grace of Our Lord’s Scourging, come down into my soul and make me truly mortified. Eighth Decade: We offer Thee, O Lord Jesus, this eighth decade in honor of Thy cruel crowning with thorns, and we ask of Thee, through this mystery and through the intercession of Thy Blessed Mother, a great contempt of the world [mortification of pride]. One Our Father, ten Hail Marys, Glory be to the Father . 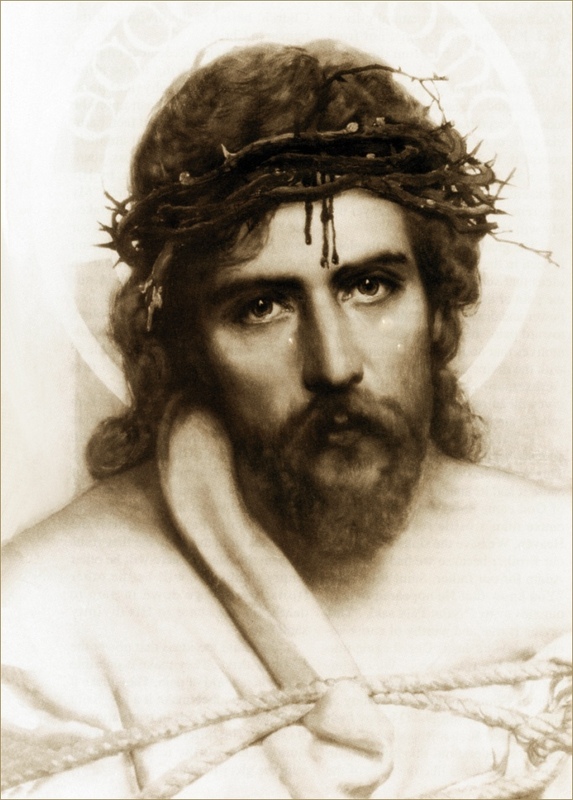 . . Grace of the mystery of Our Lord’s crowning with Thorns, come down into my soul and make me despise the world. 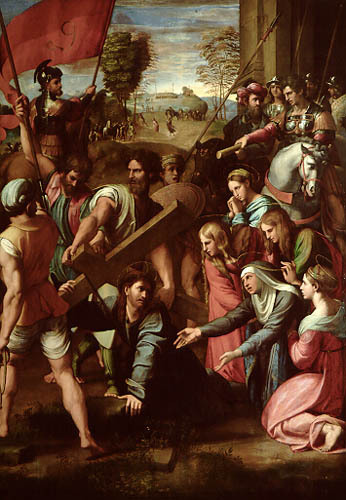 Ninth Decade: We offer Thee, O Lord Jesus, this ninth decade in honor of Thy carrying Thy Cross and we ask of Thee, through this mystery and through the intercession of Thy Blessed Mother, to give us great patience in carrying our cross in Thy footsteps every day of our life. One Our Father, ten Hail Marys, Glory be to the Father . 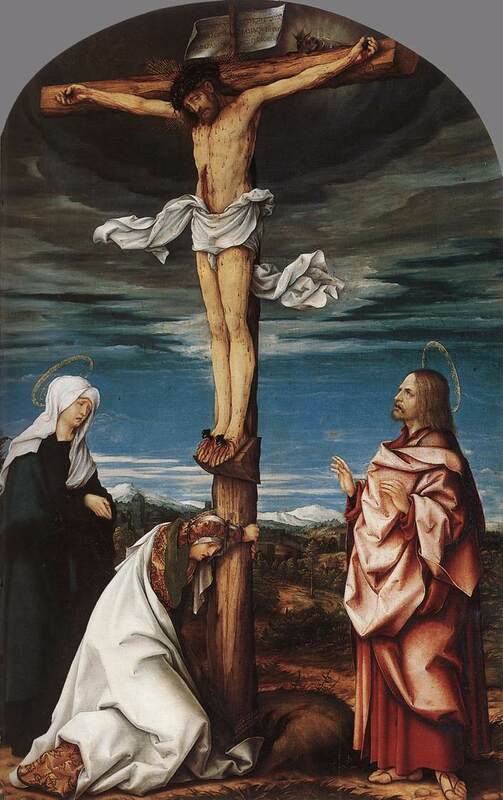 . . Grace of the mystery of the carrying of the Cross, come down into my soul and make me truly patient. Tenth Decade: We offer Thee, O Lord Jesus, this tenth decade in honor of Thy Crucifixion on Mount Calvary, and we ask of Thee, through this mystery and through the intercession of Thy Blessed Mother, a great horror of sin, a love of the Cross and the grace of a holy death for us and for those who are now in their last agony. One Our Father, ten Hail Marys, Glory be to the Father . . . Grace of the mystery of the Death and Passion of Our Lord and Savior Jesus Christ, come down into my soul and make me truly holy. 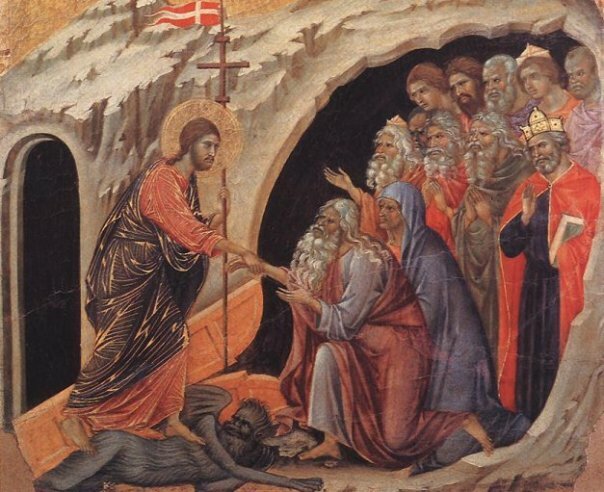 Eleventh Decade: We offer Thee, O Lord Jesus, this eleventh decade in honor of Thy triumphant Resurrection and we ask of Thee, through this mystery and through the intercession of Thy Blessed Mother, a lively faith. One Our Father, ten Hail Marys, Glory be to the Father . . . Grace of the Resurrection come down into my soul and make me really faithful. 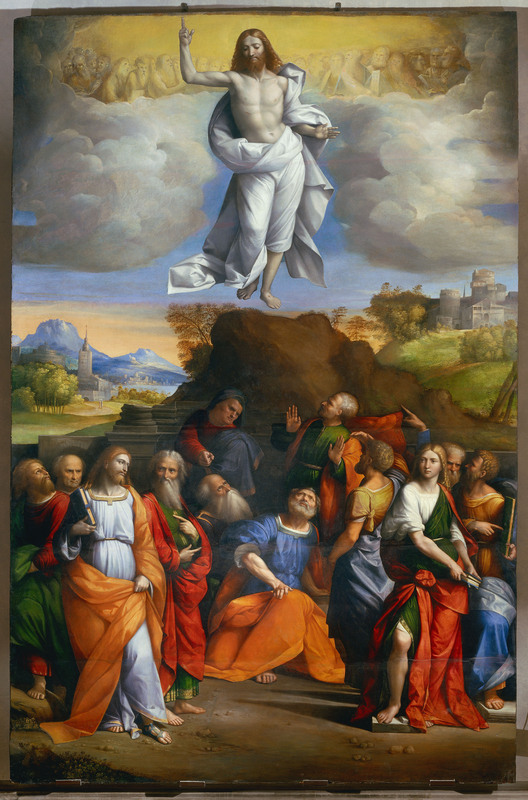 Twelfth Decade: We offer Thee, O Lord Jesus, this twelfth decade in honor of Thy glorious Ascension, and we ask of Thee, through this mystery and through the intercession of Thy Blessed Mother, a firm hope and a great longing for Heaven. One Our Father, ten Hail Marys, Glory be to the Father . . . Grace of the mystery of the Ascension of Our Lord, come down into my soul and make me ready for Heaven. 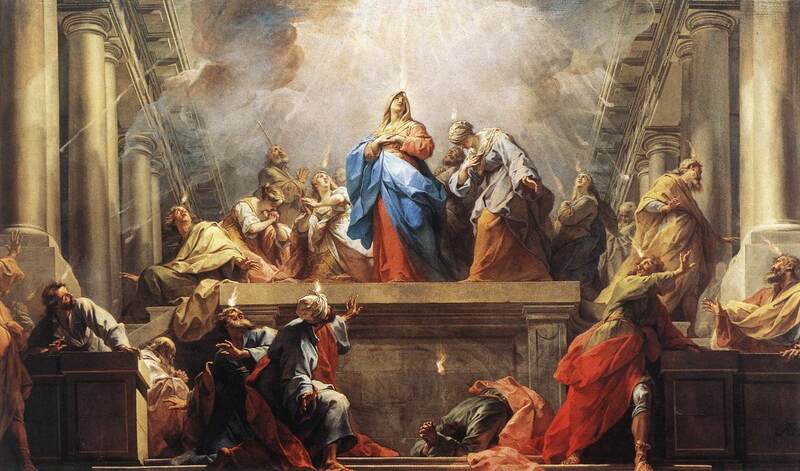 Thirteenth Decade: We offer Thee, O Holy Spirit, this thirteenth decade in honor of the mystery of Pentecost, and we ask of Thee, through this mystery and through the intercession of Mary, Thy most faithful Spouse, Thy holy wisdom so that we may know, really love and practice Thy truth, and make all others share in it. One Our Father, ten Hail Marys, Glory be to the Father . . . Grace of Pentecost, come down into my soul and make me really wise in the eyes of Almighty God. 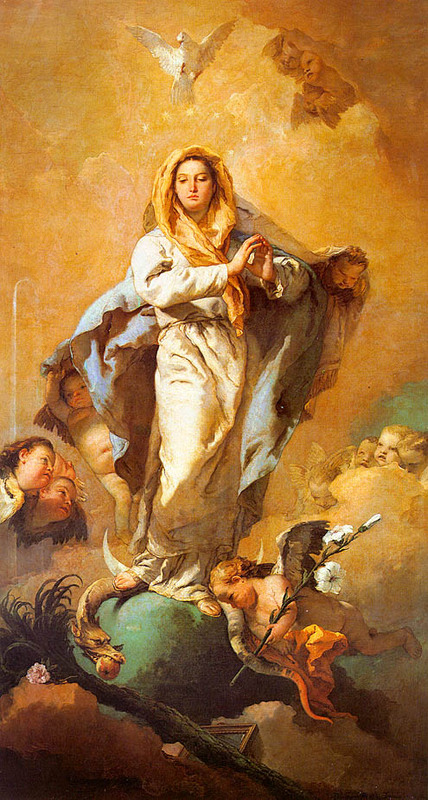 Fourteenth Decade: We offer Thee, O Lord Jesus, this fourteenth decade in honor of the Immaculate Conception and the Assumption of Thy holy and Blessed Mother, body and soul, into Heaven, and we ask of Thee, through these two mysteries and through her intercession, the gift of true devotion to her to help us live and die holily. One Our Father, ten Hail Marys, Glory be to the Father . . . Grace of the Immaculate Conception and the Assumption of Mary, come down into my soul and make me truly devoted to her. 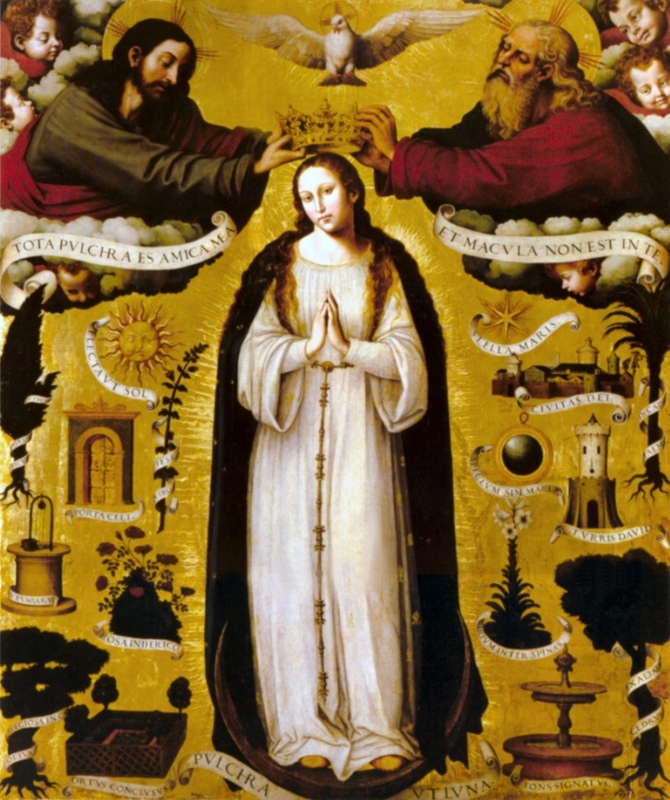 Fifteenth Decade: We offer Thee, O Lord Jesus, this fifteenth and last decade in honor of the glorious crowning of Thy Blessed Mother in Heaven, and we ask of Thee, through this mystery and through Her intercession, the grace of perseverance and increase of virtue until the very moment of death and after that the eternal crown that is prepared for us. We ask the same grace for all the just and for all our benefactors. One Our Father, ten Hail Marys, Glory be to the Father . . . We beseech Thee, dear Lord Jesus, by the fifteen mysteries of Thy life, death and passion, by Thy glory and by the merits of Thy Blessed Mother, to convert sinners and help the dying, to deliver the Holy Souls from Purgatory and to give us all Thy grace so that we may live well and die well—-and please give us the Light of Thy glory later on so that we may see Thee face to face and love Thee for all eternity. Amen. So be it.